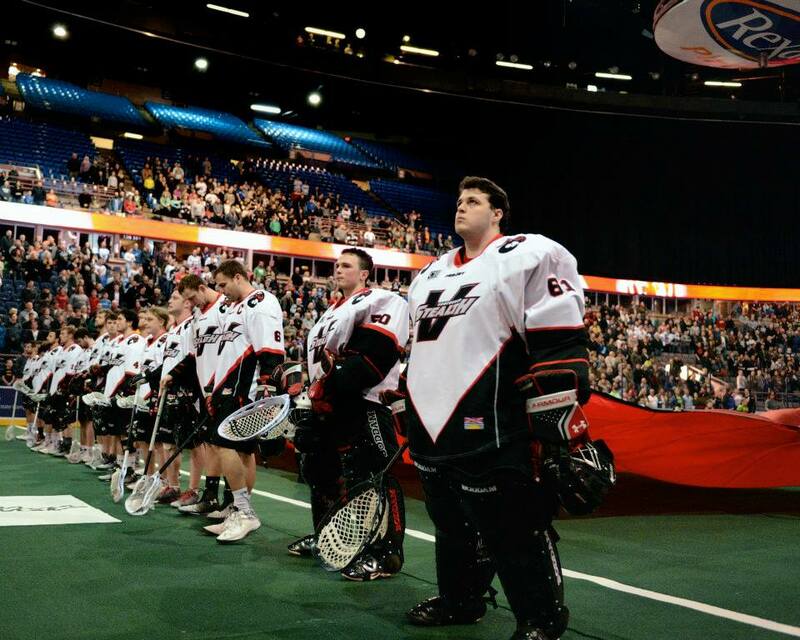 The Vancouver Stealth kept pace with the surging Calgary Roughnecks in the hunt for the third playoff spot in the NLL’s West Division with a huge 11-9 win over the New England Black Wolves Sunday afternoon. Stealth head coach Dan Perreault said his team’s buy-in showed on Sunday as they fought tooth and nail for a potentially season-saving win. The pressure situation the Stealth thrived under yesterday was a great sign for the team’s mentality as they head into the pivotal stretch run before the playoffs. Balance was the name of the game on Sunday, as every Stealth offensive player found the back of the net. Rhys Duch led Stealth scorers (this is not a recording) with five points—two goals, three assists. The Stealth were able to hold on in the fourth quarter, up 9-7, despite only registering 10 shots to New England’s 21. Vancouver was able to ride the wave of percentages, scoring 11 goals on just 47 shots total on goaltender Evan Kirk. Eric Penney had by far his best game of the season Sunday, stopping 59 saves on 68 shots and looking like a stud goaltender in the process. The Black Wolves were even across the board in terms of goal scoring—they scored five goals on 34 shots in the first half and four in the same amount of shots in the second half. “They had 11, we had 9,” Black Wolves head coach Blane Harrison said to NLL.com. Newly acquired Garrett Billings had another quality game for New England, adding a goal and three assists on eight shots. He’s fit into the Black Wolves offense well, and his arrival has allowed room for some unheralded players, such as Mark Cockerton and Brett Bucktooth, who had a combined nine points on 21 shots. On Vancouver’s end, Joel McCready had another great performance and has to be considered the team’s most steady player this season, if not a team MVP candidate. Every time McCready shows up to score a goal, it’s clutch; when the game was 10-8, McCready was the one who stretched it to a three goal lead. This season has been a tough opening campaign for New England, but it’s not unlike what the Stealth went through last season. The 4-9 Black Wolves have the worst record in the NLL but can take the rest of the season to evaluate what they have from young players like Cockerton and Pat Saunders and plan for next season. After Calgary split their home-and-home series with Edmonton this weekend, Vancouver still holds the final spot in the West Division playoff picture by a half game. The Stealth do get a bit of a break next weekend when they host the three-time defending champion Rochester Knighthawks—Rochester plays Friday night in the high altitude of Colorado, meaning the Stealth will get a tired team on a true back-to-back. It’s the perfect opportunity for the Stealth to continue building momentum in their quest for a playoff spot.